Yogurt is a greatÂ ingredient usedÂ in a number of the homemade beauty recipes because of its natural lactic acid and enzymes.Â As I’ve written before, the beauty benefits of yogurt include soothing, softening and hydrating the skin, leaving it soft and smooth.Â In addition, because yogurt has antibacterial and antifungal properties, it also provides excellent cleansing properties.Â The best thing about yogurt is that it is so versatile and can be used alone or with any other ingredients.Â Anyway, don’t take the raves just from me; read the glowing reviews of using yogurt mask at Makeupalley. Eighty-seven reviewers gave the mask a 4.7 out of 5 rating! 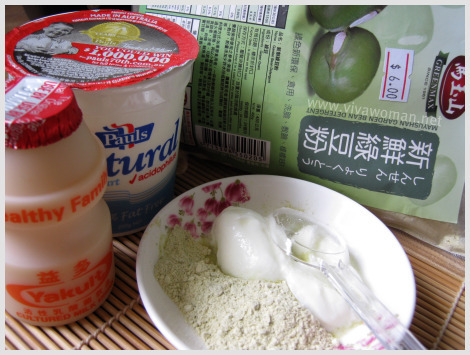 I personally like the 99.8% fat free natural set yogurt from Pauls.Â I scooped a big teaspoon of the yogurt and mixed it with a teaspoon of matcha powdered green teaÂ and a quarter teaspoon of manuka honey.Â All I needed to do was to blend the mixture and then apply it as a mask on my thoroughly cleansed andÂ dry face.Â Â The mixtureÂ wasn’t thick as you can see from the picture but it didn’t drip so I can walk around in this for about 15 toÂ 20 minutes before rinising itÂ off with luke warm water. In fact, this mask can dry up pretty quickly on your face if you do not over apply. Matcha powdered green tea mask by itself is Â fabulous as I’ve written about before and offers wonderful antioxidant benefits.Â But it works even better with yogurt and manukaÂ honey.Â Â Manuka honey by the way, is renowedÂ forÂ its anti-bacterial,Â anti-inflammatory and healingÂ properties and makes a great cleanser or mask for our face too as it helps to hydrate our skin.Â Â Â You can read more about this in my entry onÂ benefits of manuka honey for our skin and how to use it for a DIY facial massage. I like this recipe and will likely continue using it. It’s definitely easier than having to grind my rolled oats and not as messy too! More importantly, Â I get antioxidant benefits plus the yogurt and manuka honey definitely help to hydrate my skin better, leaving it softer and more supple.Â Â However, just like most facial masks, the effects are transient and need to be sustained with continual usage.Â Â The only drawback is the smell of the yogurt isn’t at all delish! do you wash your face with cleanser as usual after this yogurt mask? No need. You use this mask after you wash your face clean. After using the mask, just rinse with luke warm water. i like paul’s yogurt, its yummy to eat and good for the face too!! 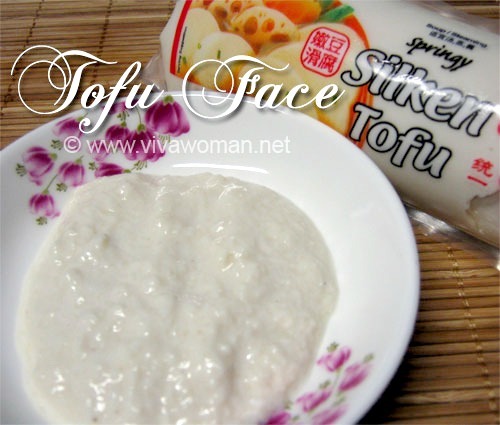 this is a wonderfully natural face mask, thks for sharing! 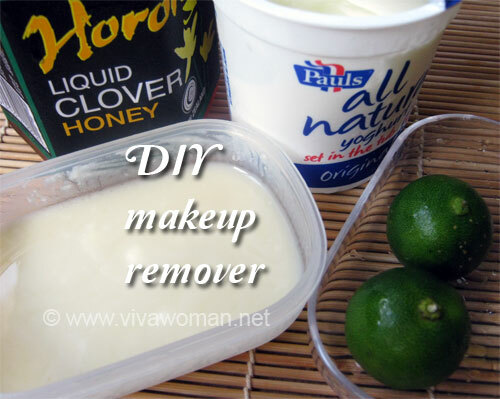 just a word of caution coz i’ve personally tried DIY honey n yoghurt mask. Yoghurt on its own made my skin soft n supple but when i added honey, my face started to itch n became very red. i guess i’m allergic to honey when used externally. coz drinking honey doesn’t cause me any allergic reaction. ladies may wanna do a spot test before application. Hazel, I suspect the honey you use may not be suitable for topical application. This manuka honey I use has been tested for topical application and I’ve been using it so far without problems. But you’re right; it’s better to be careful especially if your skin is sensitive. just a tot, if you had one bottle MGO 250 Manuka Honey and one bottle of MGO 100 Manuka Honey, would you choose to eat the MGO 100 and save the MGO 250 for facials? Or the opposite? I’m aware that the higher the MGO, the more active ingredients it contains, but I’m trying to see if i can use the honey more effectively and more efficiently while saving money as the higher grades cost more. Both food consumption and topical application have different absorption rates…so i was thinking of having one bottle each for different usage. BTW I’m currently drinking MGO 100 and using it on my face as well. I would keep the one with the higher UMF for ingesting cos the MGO100 is quite good for face. I bought the MGO250 cos most of it are for eating. I only keep a small portion in another bottle for the face. No need to use a lot actually. I actually eat the honey direct but not everyday. I usually forget…but it’s really good for throat problems or coughing. So far, very good for my son. do you feel the need to moisturize afterward? if so what moisturizer do you use? Yes, I do moisturize afterwards either with my usual moisturizer or with a face oil like grapeseed oil or emu oil. I realized from some comments that some people could be allergic to honey so it’s better to be careful if your skin is sensitive. The honey should preferably be suitable for topical application. I’m using this right now and it feels so nice~! I’m using organic yogurt and gah, feels so nice and cool~ I’ll post on how it worked! I hope this helps with the some redness I have from this winter. Stupid wind. It’s best to use this immediately so I suggest you mix just enough for one usage. I’m not keen on using this even the day after. But yogurt can keep up to a week in the fridge over some readers told me they can’t and it’s only 3 days. i have a question..how many times per week should i use it? Once or twice should be sufficient. Hi there may i know where to get the matcha powdered green tea? You can get it at Japanese supermarkets like Meidiya. If you live in the states, try Whole Foods. Just want to say that I just used this and it was AMAZING! I have had a few troublesome dry spots and nothing was working. Seriously! I would use all the face hypoallergenic moisturizing cream I could find – moisturizer would dry up and dry spots would flake a day later. I ended up trying to use my vitamin E capsules (breaking the capsules to secrete the oil inside) on the dry spots and combine that w/ my moisturizers and that only partially worked – dry spots would flake a few days later. Basically I became desperate. I was looking for a remedy that would not force me to go to get a professional facial (they are expensive and results vary). Luckily, a friend suggested your site and this recipe for a homemade hydrating mask. VoilÃ – my dry spots are gone. I am shocked and utterly thrilled. I have never used home remedies before, but I will be trying more of the ones you suggest (I love yogurt now). I will definitely following your blog, which is the first for me. I will definitely be recommending my friends to your site as well. Thank you! Keep blogging! P.S. Of the three products I had to purchase the only cheap item was the yogurt. The specific green tea and honey were quite pricey, this could be because I live in Chicago and/or I could only find them at Whole Foods (which is pricey). Good thing I don’t need to use a lot of the pricey items when making the mask. I’m glad it worked well for you! I feel happy too. 🙂 But just note that you check for the stability because this is afterall homemade so you can’t keep it for too long. Check for weird smell and stuff and make small batches. For yogurt, it’s good as an exfoliator type of mask. 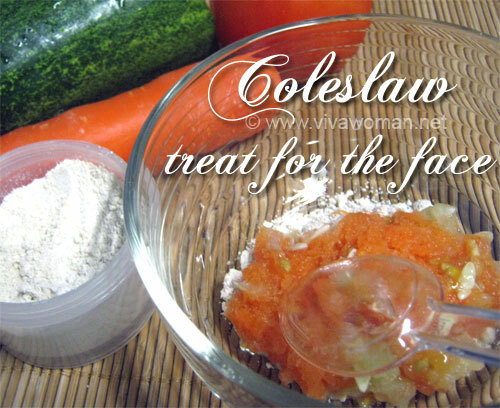 You can use it on its own or mix with oat flour (my fave). Can i use this mask everyday like twice a day ? I think once is good enough. You should try to apply hydrating lotion.